My name is Zedekiah Anthony Marshall I was born and currently live in Castlemaine, a very small town located in Central Victoria. Earlier this year I celebrated my 16th birthday. I’m one of four children to my parents Craig Marshall and Gabrielle Bertoni-Marshall. I am the third born and have two older sisters and a younger brother. We are a very sporty family and I grew up watching my parents and sisters play and coach sport and also heard lots of stories about my dads sporting abilities growing up and how he nearly made it to VFL. Ever since I knew what AFL was, I started to follow Essendon Football Club and if asked to identify why I chose to barrack for them I honestly couldn’t tell you, “I just do”. I knew I needed to be fully committed to my dream to take on the 5.45am wake up call every morning and spend 4 hours commuting to school each day. After attending Highview Christian Community College for 4 years I started to ask Mum and Dad if there was an AFL school and if there was how cool it would be to attend one. Not thinking of it as being a reality at first I started to research about it and found a couple of schools with a football curriculum. So Dad and I went and had interviews with some and decided that The Academy seemed the best for me as it offered both a high level of education and football elements. To go to The Academy I had two Skype interviews with Casey, The Director of Operations. After being selected I went to the The Academy in Essendon to see the facilities and to meet Alex Rance and Luke Surace. After meeting them I knew I had made the right decision. To attend The Academy I only had to sign transfer forms from Highview and my parents did the rest. Honestly I didn’t have to convince my parents to move schools and I just had to ensure they understood that I was making the right decision for me. I knew I needed to be fully committed to my dream to take on the 5.45am wake up call every morning and spend 4 hours commuting to school each day. 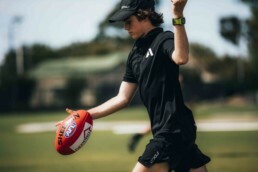 My decision to attend The Academy was because of the strong education they offered and it could increase my chances of becoming an AFL player and teach me the discipline required to be the best footballer I can be. My first term at The Academy was all I hoped, whilst doing the required schooling for the day, I am involved in PE classes, swimming, spin classes, fitness tests, sprints, pilates, gym and football techniques sessions. I love all elements of the training and the physical changes I have noticed in my body has been exciting. I don’t know if it’s coincidence or all of my training over the term but I have had many personal bests. Being part of The Academy has also given me the privilege to hangout with Alex Rance, a current AFL legend however over the term Alex has become more of a mentor to me in sport and in life. I see him as a normal person who is just a very talented player. For me the best thing about attending The Academy is that everyone is encouraging of one another. We all share the same goals and enjoy the daily physical education side of everything. My biggest supporters are my parents, they encourage me to do my best and to strive for my dreams. When I’m not living and breathing football I like running, riding and playing basketball. At the end of the 2 years at The Academy I dream of playing for an AFL club.